You are now reading "Impact of President’s Budget and Point..."
In a study commissioned by The Drug Pricing Lab, Milliman analyzed the impact of the proposed rule to implement point of sale rebates in Medicare Part D. The analysis used claims data and drug class-specific rebates to help understand the implications of proposals to restructure parts of Medicare Part D overall, and by important categories of drugs including those for diabetes, cancer, and Hepatitis C. Findings include that the implementation of POS rebates would reduce total costs to beneficiaries on high cost medications in exchange for modest net increases in premiums for all others. 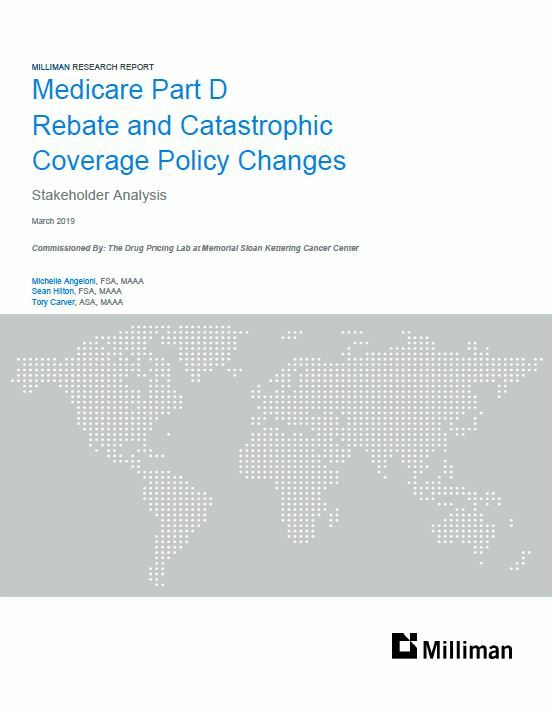 At our request, Milliman estimated the impact of an approach to POS rebates in which the pharmaceutical corporations continue to contribute funding at the same level as they do today, by implementing a separate true-out-of-pocket (TrOOP) accumulator for manufacturers based on the drug ‘list price’ rather than the net-of-rebate price. Under 100% POS rebates in Part D, this change, which essentially maintains the status quo, restores $50B in funding to Part D over the next decade. Drug category specific analyses show the feasibility of a demonstration of POS rebates only for diabetics or cancer patients, and how much these patients would save under a 100% POS model.